1895 | X-Rays: Physicist Wilhelm Röntgen discovers X-rays. Röntgen named it X-radiation to signify an unknown type of radiation. 1908 | The X: An early French automobile. c. 1920-1930 (date unknown) | BX /PX: Exchanges are known as a Base Exchange (BX) in the U.S. Air Force, whereas they are referred to as a Post Exchange (PX) in the U.S. Army. Over the next few years, exchanges operated by the Army and Air Force Exchange Service (AAFES) will be rebranded simply as an Exchange (X) to simplify differentiation between the similar sounding BX and PX names. 1930s | LAX: Prior to the 1930s, existing airports used a two-letter abbreviation based on the weather station at the airports. So, at that time, “LA” served as the designation for Los Angeles International Airport. But with the rapid growth in the aviation industry, the designations expanded to three letters, and LA became LAX. The letter X does not otherwise have any specific meaning. Today “LAX” is often used as an indicator of identity by local residents. 1936 | The X-Acto Knife: Invented by Sundel Doniger, a Polish immigrant to the United States. Doniger had planned to sell his fancy knife to surgeons as a scalpel, but it was not acceptable, because it could not be cleaned. His brother-in-law, Daniel Glück (father of poet Louise Glück), suggested that it might be a good craft tool. The X-Acto knife may be called a utility knife, but it is actually a short, sharp blade mounted on a pen-like aluminum body, used for crafting and hobbies, such as modelmaking. 1938 | X-Ray Vision: Among the best known figures with “x-ray vision” is the comic book character Superman. However, the first “person” with X-ray vision in a comic book was Olga Mesmer in 1938s Spicy Mysteries. Olga was also one of the first female superheroes. c.1939 | XU: X for “unknown” and U for “undercover agent,” XU was a clandestine intelligence organization working on behalf of Allied powers in occupied Norway during World War II. Most of XU’s operations, and its organizational structure, were kept secret until 1988. The name of the organization may have derived from Lauritz Sand, one of the founding members, who had previously worked for British intelligence in Dutch India. 1946 | X-1: The U.S. Air Force supersonic research project built by the Bell Aircraft Company. It was the first aircraft to break the sound barrier in level flight. 1951 | The Man from Planet X: A science fiction film directed by Edgar G. Ulmer. 1952 | X-2: The X-2 “Starbuster” was a research aircraft built by Bell Aircraft Company to investigate flight at Mach 3. 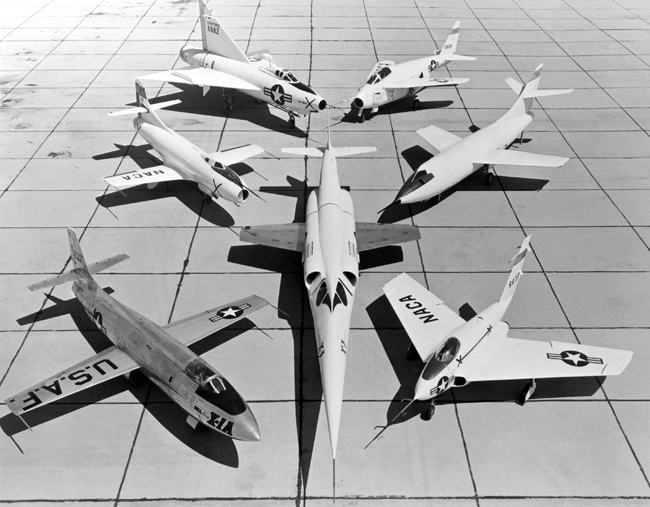 1952 | X-3: The X-3 “Stiletto” was an experimental jet aircraft manufactured by the Douglas Aircraft Company. 1957 | The Strange World of Planet X (book): A British science fiction novel by Rene Ray. The storyline: A monomaniacal scientist has invented ultra-sensitive magnetic fields, which begin to attract objects from space. Strange things begin happening, including a freak storm, and insects and spiders begin to mutate into giant monsters. An alien spaceship has appeared over London and begins to warn mankind against the dangers of this scientific experiment. 1958 | The Strange World of Planet X (movie): British science fiction horror film, and a cautionary tale about science. It was also known as Cosmic Monsters, The Crawling Terror, The Cosmic Monster, and The Crawling Horror. The film was adapted by Paul Ryder from the 1957 Rene Ray novel of the same name. 1959 | X-15: The North American Aviation X-15 was a rocket-powered aircraft operated by the United States Air Force and the National Aeronautics and Space Administration (NASA) as part of the X-plane series of experimental aircraft. 1960 | Group X: A British instrumental band. 1961 | X-15: A by film Richard Donner that presents a fictionalized account of the X-15 aircraft. 1963 | The X-Men: A team of mutant superheroes created by Stan Lee and Jack Kirby. 1965 | LZ X-Ray: The site of the first major battle of the Vietnam war, where 450 U.S. soldiers were dropped into a small clearing in the Ia Drang Valley as part of the U.S. airmobile offensive codenamed Operation Silver Bayonet. 1965 | Generation X: A book on popular youth culture by British journalists Jane Deverson and Charles Hamblett. It contains interviews with teenagers who were part of the Mod subculture. 1968 | X Rating: a motion picture rating used between 1968-1990. It was reserved for the most explicit films such as Midnight Cowboy, Beyond the Valley of the Dolls, A Clockwork Orange, Fritz the Cat, and Last Tango in Paris. Because of the heavy use of the X rating by pornographers, it became associated largely with pornographic films, so that non-pornographic films given an X rating would have fewer theaters willing to book them and fewer venues for advertising. Moreover, many newspapers refused to advertise X rated films. This led to a number of films being released unrated sometimes with a warning that the film contained content for adults only. In response, the MPAA eventually agreed in 1990 to a new NC-17 rating. 1972 | BMX: BMX or Bicycle motocross is a cycle sport performed on BMX bikes, either in competitive BMX racing or freestyle BMX, or else in general on- or off-road recreation. 1973 | X-24: An experimental aircraft developed from a joint USAF-NASA program. It was designed and built to test lifting body concepts, experimenting with the concept of unpowered reentry and landing, later used by the Space Shuttle. 1976 | Generation X / GenX: An English punk band featuring Billy Idol, Tony James, Bob Andrews, and Mark Laff. 1977 | X: The LA punk band featuring Exene Cervenka, John Doe, Billy Zoom and DJ Bonebrake. Much of X’s early material had a rockabilly sensibility. Doe and Cervenka co-wrote most of the group’s songs, and their slightly off-kilter harmony vocals remain perhaps the group’s most distinctive element. 1978 | X: An “electronic/space music” album by German musician Klaus Schulze. 1979 | INXS: (pronounced “in excess”, in-ex-ess) were an Australian rock band fronted by lead vocalist Michael Hutchence. 1980 | X-Ray: A member of the Marvel Comics supervillain team U-Foes. 1982 | X: A Japanese heavy metal rock band. 1984 | X-29: The Grumman X-29 was an experimental aircraft that tested a forward-swept wing, with canard control surfaces. 1984 | X Window System: In computing, the X Window System (X11, X, and sometimes informally X-Windows) is a windowing system for bitmap displays, common on UNIX-like operating systems. X provides the basic framework for a GUI environment: drawing and moving window. It was developed at the Massachusetts Institute of Technology (MIT). 1986 | X: a Norwegian film directed by Oddvar Einarson. 1986 | MX missile: The LGM-118A “Peacekeeper,” also known as the MX missile (for Missile-eXperimental), was a land-based ICBM deployed by the United States. 1986 | X: The stock symbol for United States Steel Corporation / USX Corporation. 1987 | SXSW: South by Southwest is a set of film, interactive, and music festivals and conferences that take place every year (usually in March) in Austin, Texas. 1990 | X: Australian rock band INXS’s seventh studio album. 1991 | X-31: The Rockwell-Messerschmitt-Bölkow-Blohm X-31 Enhanced Fighter Maneuverability program was designed to test fighter thrust vectoring technology. Thrust vectoring allows the X-31 to fly in a direction other than where the nose is pointing, resulting in significantly more maneuverability than most conventional fighters. 1991 | Generation X: Tales for an Accelerated Culture: The Douglas Coupland novel that popularized the term Generation X, which refers to Americans who reached adulthood in the late 1980s. 1992 | X: An early three-dimensional first-person shooter-type video game released for the Game Boy in Japan. 1992 | X: Japanese manga, anime film and anime television series. 1993 | The X-Files: A science fiction television series created by Chris Carter. 1993 | X-Plane: a computer flight simulator created by Laminar Research. 1995 | X Games / Extreme Games: ESPN’s annual extreme sporting event. 1995 | Planet X Television: TV show, with a focus on action and extreme sports; launched on Prime Sports (now known as FSN / Fox Sports Net); the same summer as ESPN’s X Games (then known as the Extreme Games). 1995 | X Prize Foundation: A non-profit organization that designs and manages public competitions intended to encourage technological development that could benefit mankind. 1996 | XML: Extensible Markup Language (XML) is a markup language that defines a set of rules for encoding documents in a format that is both human-readable and machine-readable. 1997 | Xfm: An English brand of commercial radio stations focused on alternative music. 1999 | XM Satellite Radio: In 1992, American Mobile Satellite Corporation (AMSC) established a unit called the American Mobile Radio Corporation dedicated to developing a satellite-based digital radio service; this was spun off as XM Satellite Radio Holdings, Inc. in 1999. The satellite radio service was officially launched on September 25, 2001. 2000 | XRay Magazine: A monthly urban arts and issues publication based in Cincinnati, Ohio. 2000 | X-35: An experimental aircraft developed by Lockheed Martin for the Joint Strike Fighter Program. 2000 | X-Men: A superhero film based on the Marvel Comic. The film directed by Bryan Singer features an ensemble cast that includes Patrick Stewart, Hugh Jackman, Ian McKellen and Halle Berry. It depicts a world in which a small proportion of people are mutants, whose possession of superhuman powers makes them distrusted by normal humans. 2000 | X.com: Founded by Elon Musk after several consolidations, it was renamed PayPal and expanded rapidly in 2001 primarily as a result of its use on eBay. 2000 | FedEx: Federal Express changed its name to FedEx and re-branded all of its subsidiaries. OK, technically an “Ex” rather than an “X”, but heck, it’s a ubiquitous phonetic “X” if ever there was one. 2001 | Xbox: Microsoft’s video game console. 2002 | SpaceX: Space Exploration Technologies Corporation is a space transport services company. It was founded by former PayPal entrepreneur and Tesla Motors CEO Elon Musk. 2003 | Operation Planet X: During Operation Iraqi Freedom, Operation Planet X was an US Army raid conducted near the village of Ad Dawr by elements of the 1st Brigade Combat Team, U.S. 4th Infantry Division and Task Force Ironhorse. The name of the operation may have been inspired by the cartoon Duck Dodgers in the 24½th Century. 2004 | The X Factor: A reality TV music competition created by Simon Cowell. 2005 | Xbox 360: competes with Sony’s PlayStation 3 and Nintendo’s Wii as part of the seventh generation of video game consoles. 20xx | Google X: A semi-secret facility run by Google dedicated to making major technological advancements. Work at the lab is overseen by Sergey Brin, one of Google’s co-founders, and by scientist and entrepreneur Astro Teller. 2006 | Xmarks: Xmarks, formerly Foxmarks, was a San Francisco-based company which produced an add-on to web browsers, also entitled Xmarks. The company was founded in 2006 by Mitch Kapor and was acquired by LastPass in December 2010. 2007 | Google Lunar X Prize: A space competition organized by the X Prize Foundation, and sponsored by Google. The challenge calls for privately-funded spaceflight teams to successfully launch a robotic spacecraft that can land and travel across the surface of the Moon while sending back to Earth specified images and other data. 2010 | Xfinity: Comcast Corporation’s cable division. 2013 | X-56: A modular unmanned aerial vehicle designed to explore High Altitude, Long Endurance (HALE) flight technologies. 2013 | IEX: An American stock exchange, organized as an alternative trading system. 2014 | X-Men: Days of Future Past: The seventh film in the X-Men film series. Source: Wikipedia is the primary source consulted for this post. One more for you: the Nokia X, X+, and XL, hybrid devices introduced earlier this year.